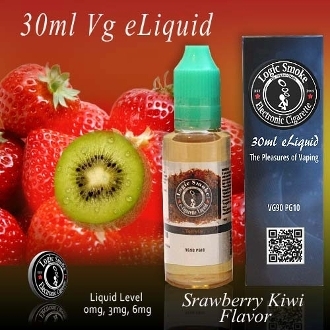 You'll love the perfect blend of fresh, sweet strawberries and the exotic flavor of an ever-so-slightly-tart kiwi fruit in Logic Smoke Strawberry-Kiwi electronic cigarette e-liquid.It's one of our newest flavors and it has become an overnight sensation! Definitely a truly enjoyable vaping experience, based just on flavor alone. But add in the big billowing bursts of vapor that you'll get when you use it in your favorite MOD unit, you won't be able to get enough. Try the latest addition to our Logic Smoke e-liquid collection and enjoy it today!